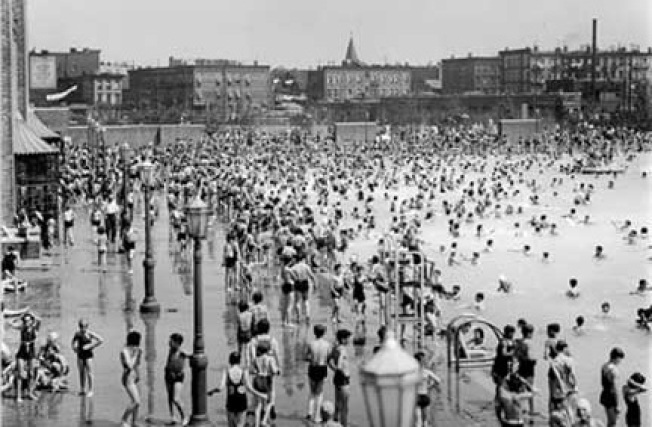 McCarren Pool back in its hey day. Earlier this month, the Parks Department announced that the names for several parks, including the McCarren Pool, were for sale. A group calling themselves Pool Aid has started a petition to stop the sale. McCarren Park, originally named Greenpoint Park, has held the name of Patrick Henry McCarren -- a powerful, if controversial, Brooklyn Democrat, infamous for his questionable ties to the Rockefeller’s Oil Company and for thwarting Tammany’s plans to appoint William Randolph Hearst as governor -- since his death in 1909. Robert Moses built the actual pool thirty years later. The pool was closed in 1984 and was vacant until 2006 when, thanks to a sizeable donation by Clear Channel, it began hosting concerts, the last of which took place in August of 2008. The pool is now under construction to become a pool again, the name of which is worth $2-$5 million and the shows have found a new home at the East River Park. Hipsters are a sentimental group, but you have to admit that in keeping with the spirit of our times, changing the name from a corrupt politician to that of a corrupt corporation does make some sense.